The Tabriz Historic Bazaar Complex is one of the oldest and largest bazaars of the Middle East. Tabriz has been a place of cultural exchange since antiquity and its historic bazaar complex was one of the most important commercial centres on the Silk Road. The most prosperous time of Tabriz and its complex Bazaar was in the 13th century when town became the capital city of Safavid kingdom. The city lost its status as capital in the 16th century, but its Bazaar has remained important as a commercial and economic center. 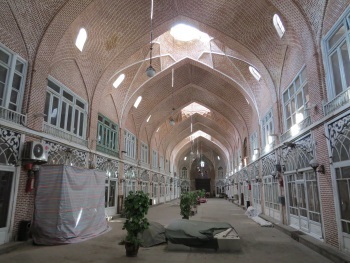 The Tabriz Historic Bazaar Complex has been declared a WHS because of its original lay-out and architecture. The nomination file goes into extreme detail about Iranian bazaar types and customs, this apparently is “a central bazaar with radial gate-bazaars”. The 3 inscribed locations are the Grand Bazaar and 2 of the remaining secondary bazaars. It’s also one of the oldest bazaars still in use: Tabriz was already a bustling town in the 13th century, when it was an important commercial stop on the northern route of the Silk Road through Iran. We arrived at the Grand Bazaar late in the afternoon. It still is a popular shopping district in this city of 1.5 million inhabitants, and many shoppers were about. Both modern necessities such as kitchen utensils and traditional goods like nuts and spices are sold. The figs especially are to die for, soft and sweet - nothing liked the dried out objects you’ll find in supermarkets in Europe. Despite the bazaar’s age, it does feel quite modern and not as atmospheric as for example the medina’s of Fez and Marrakech. People in my tour group that had been to Aleppo, the most similar WHS because it’s also a covered bazaar, preferred that one over Tabriz too. In the bazaar’s back alleys and behind closed doors there is however more to discover than appears at first sight. The bazaar not only has a commercial function, it provides a social and religious one too. We had a quick look into a huge covered caravanserai (timcheh). And we visited a sizeable, brick vaulted Shia mosque. Behind a curtain there we found some black ‘Ashura’ banners, used for the most important religious day in Iran. It’s the festival known for its bloody self-flagellation rituals, although this is discouraged in modern Iran. Within the protected area of the Bazaar complex also lies the ‘Blue Mosque’ (which also mysteriously still features on Iran’s Tentative List). Looking at the UNESCO map it seems indeed connected to the Grand Bazaar, but in practice it requires a taxi ride from the bazaar to get to this mosque. Its renovated brick backside faces the main street, but when you walk around it a monumental gate like that of the masterpieces in Uzbekistan appears. This mosque was built in the style of the Mongolian Timurid dynasty in the second half of the 15th century. Tabriz was at that time the capital of East Persia. The mosque has suffered badly during the past - an earthquake in 1779 largely destroyed it. On 19th century sketches made by passing European travelers it is shown as virtually a ruin. Since then much brickwork has been added to make it whole again. But it is far from finished – according to our guide there is disagreement about how to proceed. Although certainly worth a visit for a couple of hours, Tabriz Bazaar was the least exciting of the 6 WHS that I visited during my tour of Northern Iran. But the name ‘Tabriz’ for me will forever be connected to the ‘Tabriz meatballs’. Ordering this from the menu in a touristy restaurant in Tabriz’s Luna Park, I expected to get something like kofta. But this is one big ball of ingredients, filled at its core with egg and chicken. With some difficulty I managed to eat half of it. a. We visited first in the late afternoon and then again briefly the next morning to catch up on some areas which had been closed. It was a surprise to us to discover that, rather contrary to “popular belief” regarding a country which “stays up late”, a lot of the bazaar closes for the day around 4-5pm. Many areas of the bazaar are primarily wholesale (or even manufacturing) locations and their “business” is done early, unlike that of the tourist and gold etc areas! This early closure particularly impacts the Carpet Bazaar (The Mozaffarieh Timcha) if you want to see that (it is quite nice to watch the “carpet finishers” working on the floor of this area). You may not even know that such areas exist as they close off access from the main Bazaar by shutting their enormous mediaeval doors and you would have no idea of what lies behind. b. To “add value” to the visit experience it is worth trying to understand and chase down the different social and architectural elements of the Bazaar as described in the AB evaluation and (more fully) in the Nomination file (Sarays, Timchas, Rastas, Charsugs, Dalans and Bazarchas!). Their names are usually marked by brass plates within the bazaar. The essence of Tabriz Bazaar’s case for OUV lies in this range of architectural and social spaces. c. Maps of the main covered bazaar are as rare as hens’ teeth. Our guide managed to get one from the nearby “Constitution House” museum. I provide this link to a photo of it as it shows all the different architectural elements rather nicely in different colours. d. Like Els, I find the official inclusion of the Blue Mosque within the “Bazaar” very strange – particularly as it still remains on Iran’s T List and also that, within the confines of the Mosque itself, there is absolutely NO indication that it has been inscribed! The area behind the mosque (i.e facing its historic main entrance) which is shown on Nomination File maps as leading to the bazaar actually seems to have no physical link to it and indeed seemed to be a large building site. I wonder if Iran felt it needed to include it to beef up the OUV or, alternatively whether it was “slipping in” a building which might not justify nomination on its own? ICOMOS comments merely that “the15th C Gol Machid merits inclusion…by virtue of its relation to the Karaney-khana, Rahli and Kohna Bazarchasi and its importance as a monument in its own right”. The argument for including these additional bazaar areas seems to be that the main bazaar area we see today has been unnaturally curtailed by the modern dual carriageways of Jomhuriye Eslami and Shahad Motahhari Streets (see map). Well, possibly, but the argument seems a bit “thin” to me, especially the comment that it justifies inclusion as “a monument in its own right” – maybe, but then it shouldn’t utilise the Bazaar’s OUV! e. I wouldn’t like to attempt comparisons with other bazaars on the List, despite having visited Aleppo and Damascus in happier times, together with many other examples across the Middle East. It is perhaps true that Iran did well to identify a particular “differentiating point” for the nomination in the form of the Bazaar’s “socio-architectural” significance. We are not great “shoppers” whilst travelling and gain no particular pleasure from perusing their souvenir stalls, so “Bazaars” for us usually only provide a quick opportunity to gain a bit of local colour and look at piles of spices, “foreign” fruits etc! The additional interest gained from looking at the Bazaar from a different viewpoint did “add value” for us. How unique these aspects really are is another matter – by looking for them we certainly saw them later in the trip e.g at Isfahan. However, as the Nomination indicates, Isfahan did post-date Tabriz. 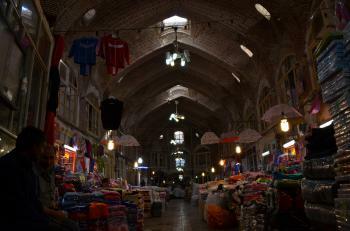 If you get to Tabriz, sooner or later you will end up in the covered bazaar some say the biggest in the world. Few years ago we still had two biggest bazaars in the world - the second one being Al-Madina Souq in Aleppo, but what happened to the Syrian one, we all know and shame on all of us for that. Tabriz is a very big city and the bazaar is not centrally located - it used to lie in the center of the town but as Tabriz became the main trading post between Turkey and Iran, most of the city moved southward. But the bazaar remains the real heart of the city if not of the whole West Azerbaijan. The main entrance is easy to miss, but don't worry you can always use one of the small gates. What you can expect? A labyrinth-like kingdom where you can find anything you wish. Carpet, gold, spice, perfume, shoes, food, things you need and things you cannot even name - all's there. More than 20 timches (big vaulted halls), hundreds of alleys and thousands of shops. Go there in the late afternoon! And don't be afraid of the crowd! People are very friendly, they are business people but will find time to serve you a cup of tea or coffee. 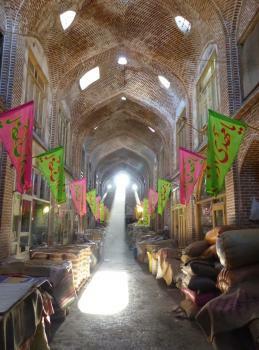 In the bazaar itself there are more then 20 caravanserais and Friday Mosque with a brick vaulted interior. In the western part of the bazaar you can see some halls and rooms with 15th century walls! Tabriz is not a very interesting city, but if you're there you should see the ruins of the blue mosque and Azerbaijan museum; there are some Armenian churches too but they're far from being gems of architecture. For 10 euro you can go to Iranian cave city of Kandovan, the trip can be organized by any hotel or tourist information or the museum. I am from Tabriz. Interesting part of memories about Tabriz Bazaar goes back to my childhood time even before grade school walking with my family in this wonderful and naturally well warmed covered places watching shops after shops with almost anything a child might think about,while it was snowing with hard winter whether outside. In summer, just avoiding the heat of mid-day sun,I used to enjoy walking in this covered and naturally well air-conditioned cool air of any Tabriz Bazaars. In my teen years I had my 25 minutes fast walking to school or back to home going through three different connected bazaars with my teen friends avoiding snow and cold weather in winter and heat of of late spring days. One should be in these bazaars to see the wonder of the world miles after miles which was completed almost over 7 centuries ago. I think the creation of miles of Bazaar in Tabriz was one of the Wonder of the world. Visit that place if you are interested to see a Wonder of the world. Tabriz lies some 750km northwest of Teheran, and can be reached by air or bus. The bazaar area lies slightly to the north of the modern city center. Be aware that important parts such as the Carpet Bazaar close early for the day (around 4 or 5 p.m.). Already inscribed, still on T List: The Kaboud Mosque a.k.a Blue Mosque, Goi Masjid, Jahanshah mosque. Tabriz Bazaar includes 28 different Mosques within the boundaries of its 3 inscribed zones. In the Nomination File (page 184) the Kaboud mosque is referenced as M28 and is used as the title of the 2nd of the zones viz - "1346-002 Kaboud Mosque"